What happens when the greats of two eras collide? 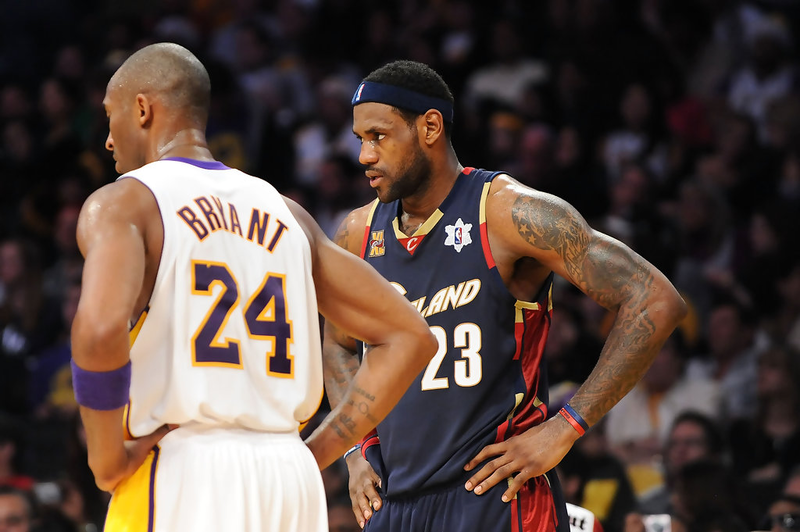 Look no further than the polarizing Kobe Bryant vs. LeBron James debate. Despite the fact that these guys consider themselves far from rivals of each other because of the generational difference, nearly everybody else with even the smallest interest in basketball takes a side as if these guys were Magic Johnson or Larry Bird in the NBA’s greatest rivalry. I find it intriguing how fans and analysts of the NBA decide one of these two players to side with. If you scroll through previous articles here on Bases and Baskets, it won’t take you long to figure out where I stand in that spectrum. For this discussion, though, a reader on our Facebook page pointed out something that piqued my interest—something more specific than a holistic comparison of two careers that are still not finished. The two traditional statistics that gives each player away for their respective seasons are the free throw percentage (Player A shot 84 percent and Player B shot 70 percent) and blocks (A: 0.3; B: 0.7). There is a difference of only one point and one assist for the respective season totals. As you have probably ascertained by now, Player A is Kobe Bryant (2012-13 season) and Player B is LeBron James (2006-07 season). This is the closest possible way to compare Kobe and LeBron directly in terms of how their individual success translated to team success. If they are supplying nearly the same quantitative output, then we can look to see how they impacted their team’s winning. This comparison is far from perfect but it certainly provides a substantial insight into how Kobe and LeBron change the game for their teams. 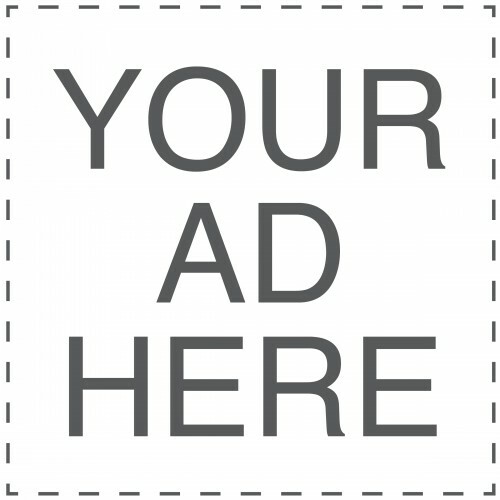 Granted, Kobe was 34 years old in 2013 and LeBron was 23 in 2007 but if you call 28-29 the prime of a player’s career, they are nearly exactly on opposite ends of the spectrum—with Kobe on the side of experience and age compared to LeBron on the side of inexperience and a relatively fresh body. In the end, the numbers say that both provided essentially the same productivity—although LeBron was the better defensive player (more blocks and rebounds per game, substantially more total DWS). Another argument that I hear brought up frequently is the West vs. East differential. The Western conference has proven to be the more competitive of the two in recent memory, that's basically fact. But when talking Kobe vs. LeBron, the strength of schedule based on SRS shows that the 2007 Cavs and 2013 Lakers played comparably difficult regular season schedules. In fact, the 07 Cavs had a slightly more difficult schedule. LeBron’s Cavs were clearly better than Kobe’s Lakers in the regular season. The difference between 50 wins and 45 wins is one between a borderline playoff team and one that is probably going to be in the hunt for a championship...as the 07 Cavs were. Before I get to the playoff discussion—which isn’t the easiest considering Kobe missed the 2013 playoffs with that Achilles rupture—there is something that further distances LeBron above Kobe in what were nearly statistically equivalent seasons. By definition, a player-efficiency rating (PER) of 15.00 is average. With that as the standard, in 2007, LeBron played with three above average players whereas in 2013, Kobe had five other above average players (Jordan Hill did play only 29 games). After adjusting for how much above average each player was using PER (ie Dwight Howard was better than Big Z and Drew Gooden was better than Antawn Jamison), in 2013 Kobe played with nearly 50 percent more minutes with players above average than LeBron (45.6%). LeBron’s seemingly equivalent season performance is given another edge when you look at the points per game averages. 27.3 PPG does not equal 27.3 PPG when you consider the fact that Kobe’s Lakers were in the top-third in team PPG (102) whereas LeBron’s Cavs were in the bottom third (97). 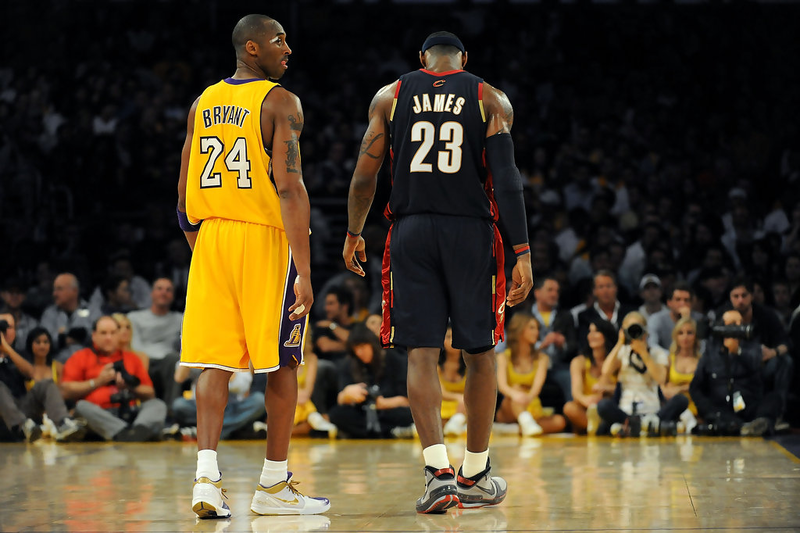 Teams facing LeBron had the luxury of keying in on him more so than Kobe’s opponents could do so to him. Even though the high-paced offense that Mike D’Antoni ran favored more PPG offensively and defensively, as the PER graphic shows, Kobe’s teammates were better. The irony is that Kobe chooses not to use them as much. The 07 Cavs counted on LeBron for more than one out of every four points they scored which points to one conclusion: LeBron makes his team better than Kobe does. Much has been made about a “killer instinct” when it comes to Kobe Bryant, Michael Jordan, and LeBron James. As Professor Michael Dyson mentioned in this segment on First Take, there is at least a partial sociological explanation for that. The fact that Kobe and MJ have this ruthless desire to win should be celebrated, but to say that it’s absence (or as Dyson called it, lack of refinement) means that LeBron is inferior completely misses the mark. James' ability to make his teammates better by facilitating their success does not come from simply a self-centered desire to win. And yet, in his sincerity, success has followed. LeBron’s role as a leader is markedly different from Kobe and Jordan. He won’t bash and/or ignore teammates like Kobe and MJ…instead he’s considered working for the NBA Players Association—something that has absolutely no self-serving purpose. If anything, it could hurt his NBA career. This, of course, involves a little bit more extrapolation on my part because Kobe didn’t play in the 2013 playoffs. First, let’s still take a look at what LeBron James did in 2007. After spraining his ankle in the very first game of the playoffs, James helped the Cavs power through the Washington Wizards in a four-game sweep. He reaped the benefits of earning a number-two seed in the East. The second round was more difficult, but James still managed to beat a New Jersey Nets team whose star point guard, Jason Kidd, averaged a triple-double for the entire series. Then came the well-known Cavs vs. Pistons semifinals. The core of this championship-savvy Pistons team (Chauncey, C-Webb, Rasheed Wallace, Tayshaun Prince, and Rip Hamilton) were all in or around their prime and were definitely a formidable matchup. Each of the first five games were decided by at most two baskets. Game 5 was one of the most historic individual NBA playoff performances: LeBron scored 29 of the final 30 points including all 18 points scored by Cleveland after regulation had ended in what was a thrilling 2OT win. In Game 6, Cleveland won convincingly, sending them to the NBA Finals. Well over-matched in the Finals, the Cavs were swept by a team stacked with not only future Hall of Fame players, but also a Hall of Fame coach. The point here is just how far LeBron was able to take his below-average team. If he didn’t blow out his Achilles, could Kobe have rallied the Lakers through the Spurs, Warriors, and Grizzlies? If the majority of the regular season was any indication as to the state of the Lakers, the answer is a vehement 'no.' Two things to consider here: if you insert a 23-year-old LeBron James for Kobe on the 2013 Lakers is the answer still no? If his performance with a far inferior Cavalier supporting squad is any indication, competing for a championship would be well within the realm of possibility. Kobe said it himself in a long Facebook post responding to that feud: leadership is responsibility. What he misses is that his method may work when he is playing with great players...but what about when it’s more difficult than getting future Hall of Famers to co-exist (and can he even do that? *cough Shaq*). Not every NBA team has great talent and might not have the best player so is it as simple as saying “I’d rather be perceived as a winner than a good teammate”? The standards for a great player are on another level because they are so great…and this is a fact that most NBA stars don’t realize. But it’s exactly why most great NBA players don’t make it as coaches. Kobe’s “way” has gained him a lot of fame but look over at what LeBron James has done and you’ll see his leadership ability is on a different level. The back-to-back titles and success in 2007 (among other seasons) elucidate that LeBron's goal of winning is far from lost. He may not be the “in-your-face” leader that Kobe is so proud to be, but four MVPs and back-to-back Finals MVPs before age 30 speaks for itself. Is Tim Lincecum Hall-of-Fame worthy?